Editor’s Note: On Feb.13, 2019, after a final attempt to reestablish contact, NASA officials announced the formal end of the Opportunity rover’s 15-year mission to Mars. The sky was darkening, and Opportunity’s batteries, powered by sunlight, were draining. The shadow of NASA’s Mars Exploration Rover Opportunity is pictured in this late-afternoon NASA handout image taken by the rover’s rear hazard avoidance camera March 20, 2014. 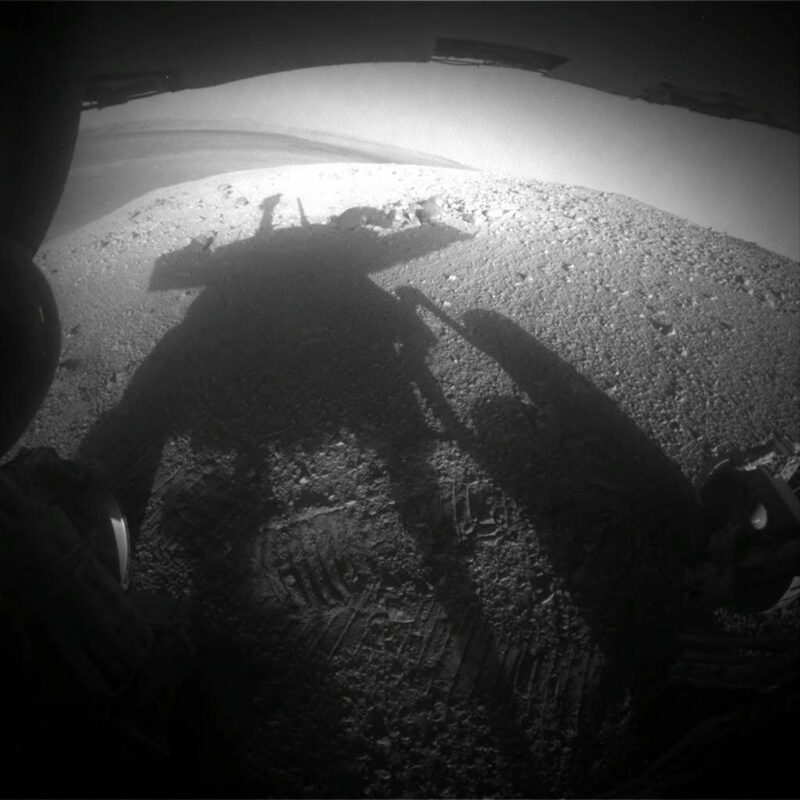 The rover’s shadow falls across a slope called the McClure-Beverlin Escarpment on the western rim of Endeavour Crater, where Opportunity is investigating rock layers for evidence about ancient environments. REUTERS/NASA/JPL-Caltech/Handout via Reuters. The “Murray Ridge” portion of the western rim of Endeavour Crater on Mars is seen in this panorama image taken by NASA’s Mars Exploration Rover Opportunity October 3, 2013 and released November 15, 2013. The ridge rises about 130 feet (40 meters) above the surrounding plain, between “Solander Point” at the north end of the ridge and “Cape Tribulation,” beyond Murray Ridge to the south. REUTERS/NASA/JPL-Caltech/Cornell/ASU/Handout. Opportunity and Spirit were tasked with finding evidence of ancient water on Mars—and they did, in torrents. They found weird rock formations shaped by flowing water. They found clay formations that could have been hospitable for microbes long ago. 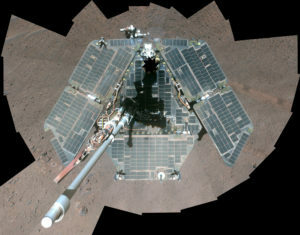 Opportunity studied more than 100 individual craters, and drove more than a marathon’s distance across the surface of the fourth planet. Together, the twin rovers brought Mars to life in a way no other explorers had before. A year into the mission, the rovers’ solar panels had slowly accumulated dust—Martian regolith is powdery, fine stuff like flour—and their sun-collecting capacity had slowly diminished. One day, Spirit’s were suddenly clean. Engineers were perplexed, and scrutinized selfies from the rover to figure out what happened, Lemmon recalls. READ MORE: Hazardous space junk is piling up. Can this satellite help? Through Opportunity, even the rocks took on lives of their own. Opportunity found odd wind-carved “aeolian” rocks, iron-rich spheres nicknamed “blueberries,” even meteorites. Lead rover driver Heather Justice, whose 16th birthday was the day Opportunity landed, found one of the most famous rocks of all. Together, the twin rovers brought Mars to life in a way no other explorers had before. A plump, rounded white object had appeared in the image. It resembled a jelly doughnut. The team frantically directed Opportunity to take selfies so they could determine whether any hardware was missing, but all was fine. The internet was not fine, however. Headlines around the world speculated the object was a message, an alien life-form, a message from an alien life-form, and other unlikely scenarios. Actor William Shatner of Star Trek fame joked on Twitter NASA should address “Martian rock throwers.” A private citizen filed a lawsuit alleging the rock was a fungal spore, and tried to compel the space agency to investigate. 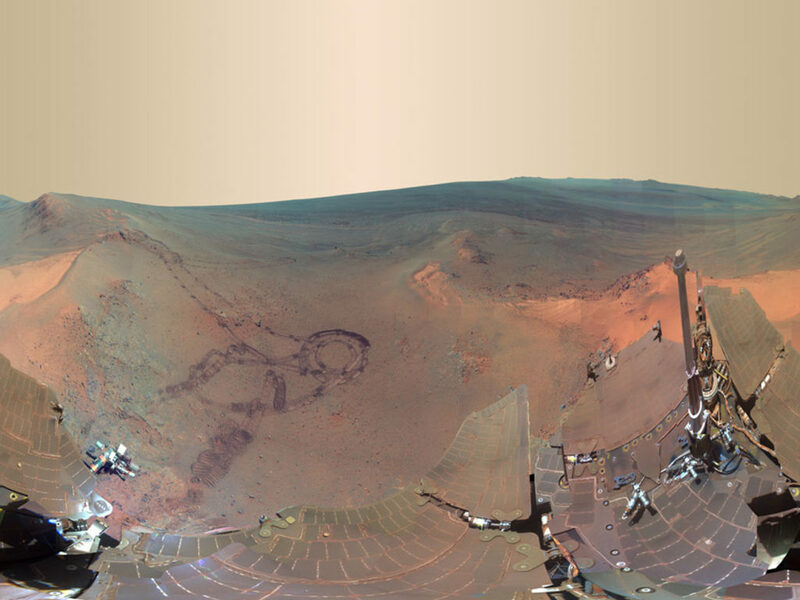 This NASA 360-degree digitally-compressed panorama image of Mars made from some of 800 images sent from the Opportunity rover on Mars shown in exaggerated colors to highlight different surface features released on July 9, 2012, shows past tracks of Opportunity (L) as well as Opportunity’s dust covered solar panels cross the image bottom and an interior wall of 20-kilometer Endeavour Crater just below the horizon and right of center. Now that the northern Martian winter is over, Opportunity is rolling again, this time straight ahead (north). The rover is set to investigate unusual light-colored soil patches as it begins again to further explore the inside of Endeavour, a crater that may hold some of the oldest features yet visited. On September 14, 2018, or Opportunity sol 5,204—that’s 5,204 Martian days, which are slightly longer than Earth days—I sat with Arvidson in his office as he worked on a scientific paper rounding up some of the rover’s findings at its final resting place, near the rim of Endeavour Crater. Arvidson and other scientists were debating the nature of a deltalike feature they nicknamed Perseverance Valley, “because we never thought we’d get there.” It might be wind-carved or it might be the work of water. The robot geologist had been trying to find out. Arvidson says he is focused on the rover’s legacy, and described his feelings as philosophical. He is soft-spoken and deliberate, a consummate scientist. But even he talked about Opportunity in anthropomorphic terms, explaining how without enough power, “she goes back to sleep,” and comparing its exploits with the travels of a favorite adventurous cousin. Weekly phone meetings between the scientists and engineering team at JPL kept everyone updated, but were also an excuse to stay connected to one another, like extended family hovering over a sick loved one. Arvidson had been here before. He has worked on every Mars mission since Viking 1, the first lander to send a photo from the surface of another planet, and watched many a robot come and go, most recently Spirit, Opportunity’s twin. Spirit lasted until March 2010, when it got stuck in a soft sand bed due in part to two broken wheels. It could not turn its solar panels toward the sun, which was slowly sinking on the winter horizon, and NASA declared the mission over in May 2011. During that 14-month wait, Mike Siebert, a former mission manager, would occasionally drive to JPL in the middle of the night, sometimes between 2 A.M. and 6 A.M., hoping to hear a signal. “My thought was, every time you did it, this could be the shift. You get one tone back from that spacecraft, and suddenly you are in full high gear,” he recalls. When I leave for lunch on sol 5,204, Arvidson walks me down the hall and we stop at a scale model of the rover, parked near the entrance of Washington University’s Rudolph Hall. I’ve seen it before, but each time I visit it seems bigger than I remember. Its solar panels, spread lotus-like toward the sun, are as wide as a couch. Its mast reaches eye level. Its arm, with its three flexible joints, is longer than my own. I stare at the mast’s eyelike cameras, one of the features that gives the rovers an open, petlike countenance. I imagine it parked on another rocky world 200 million kilometers from here. Its solar panels are caked in rust-colored flour. Its joints have grown creaky, its tools degraded, its protruding antenna scoured by flying sand. It is looking down a slope, en route to a channel where water maybe flowed eons ago, in a place people nicknamed Perseverance Valley. The orange sky is tinged with dust, but it is clearing. The view is sublime. This article is reproduced with permission from Scientific American. It was first published on Jan. 31, 2018. Find the original story here.